Today, October 1, 2016 is International Coffee Day ! When we are drinking coffee we are actually drinking the seed / cherry from the coffee plant. The world drinks over 2.25 billion cups of coffee every day ! Do you know what is involved to get you your simple cup of morning goodness? Take a few minutes to read this article and find out, or better yet take a trip to a coffee country. The coffee industry is worth over $ 100 billion world wide ( more than gold ) employing over 120 million people throughout the world. It is the most sought after commodity after oil. Coffee was introduced in Ecuador early in the 19th century, and remained one of Ecuador's top export crops into the 1970s. Today it has been replaced by oil, shrimp and bananas. Quality of coffee varies with genetic variety, altitude, weather, air, and soil - similar to wines and cacao. 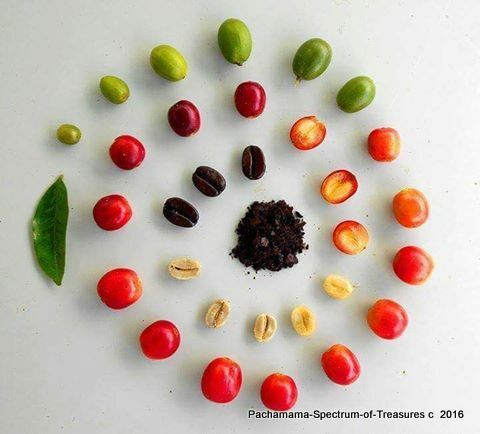 The varied ecosystems in Ecuador provide different coffee growing cultures, which creates complex and varied flavours. Additionally growing, processing, roasting, and finally the method of extraction all impact the coffee's flavour. This is why Ecuadorean coffee beans make some of the most interesting and unique cups of joe on our planet. Until recently our premium coffees, as with most agricultural products, are exported. Over 30 countries worldwide. Russia, Poland, Germany, Colombia, Italy, and the Netherlands buy over 80 percent of our total export volume. In 2015 Ecuador's total annual coffee production was about 42,600 tons ( 644,000 - 60 kg bags ) from 200,000 hectares under cultivation. World coffee production is 9.7 million tons annually - so Ecuador is a very small player producing less than .5 % of world production. However there is some recognition, and growing local demand for our home grown quality coffee. It is still fairly rare as Ecuadorians prefer, and most cafes and restaurants here use instant coffee. Actually 86 % of Ecuador's coffee production is high yield, low quality instant coffee. Most coffee is grown on small several hectare fincas, where it is co-planted with cacao, citrus fruits, bananas, and or mangoes to provide interesting flavoured beans. Today's educational coffee tour is to southern Ecuador's Loja, one of the most important coffee growing regions. About 5.5 hours south of Cuenca we arrive at a coffee farm in Vilcabamba. The coffee plants seem randomly scattered, and grow on steep very irregular misty hillsides where the morning sun gains momentum in drying the overnight dew. This high altitude is close to the sun for hotter days, colder nights, and less oxygen causing the plant more stress, which forces it to send most of its nutrients to its seed. From a North American agriculture perspective the organic farms are very natural, primitive, and poorly maintained, and as a result provide marginal yields. Protected by the haughty spirit of Saraguro's indigenous people, these 100 % arabica beans that are grown at an elevation of 1,500 meters are of high quality. The " bean belt " for growing coffee is between the latitudes of 25 degrees North and 30 degrees South. Coffee plants can live for up to 100 years, but risk of diseases such as leaf rust and roya increases with plant age. Prices fluctuate and when too low to justify harvesting the beans are left to rot on the bushes which causes problems with pests. On this finca the soil is rich and dark, the steep mountainside provides altitude, varying climate, and fresh air. Pigs and chickens are raised to " weed and aerate the soil " and contribute organic matter. Plants are usually about five years old when they first flower ( twice annually ) and set a green cherry. After about 8 months the cherry ripens and turns red. When the berries are red and ready for harvesting they are hand picked - a difficult and labour intensive process. Selectively harvesting only the ripe cherries a typical worker will collect 50 kilos daily. Red berries, with their higher aromatic oil and lower organic acid content, are more fragrant, smooth, and mellow. Coffee picking is one of the most important stages in coffee production. Farmers deliver their daily harvests to a local cooperativa for processing. Processing production encompasses the drying (wet milling) process, threshing / dry milling, classification, and roasting of the coffee beans. All green coffee is processed however the methods vary and have a significant effect on the flavor. First is the wet milling process of which there are two main ways to dry the coffee. i.) The wet process immediately depulps the bean. After the pulp has been removed the bean still has two additional layers a silver skin and the parchment. It is then left to sit overnight so that a sugar layer called the mucilage can break down and then the coffee is washed. Once all the sugars are washed off to eliminate the risk of fermentation, the coffee in parchment is placed on elevated beds to dry for about a week. This process is used for exported coffee. ii.) The dry or natural process spreads the beans out to dry in the sunshine on cement patios. They are regularly raked to prevent mold and ensure uniform drying. When coffee is dried in the fruit, the sugars of the fruit ferment and seep into the bean, if done properly these can give exotic fruity undertones and even wine notes to the coffee, but if done wrong the coffee can have a strong taste of rotten fruit. It is much less labour intensive and no water is required. It is used primarily for domestic consumption known as bola. The beans must be dried to a water content of about 10% before they are stable. Next in the threshing, or hulling process, a rustic machine removes the dry husk parchment from the green bean and sorts the beans according to size. The smallest beans are the sweetest. These cleaned and sorted beans then fill sacks which are then sent to a cooperativa roaster for the final processes of tostión or roasting. The beans are now officially considered coffee. The aroma experienced from grinding the beans was heavenly. Coffee is not a formula like Coca Cola or Sunkist orange juice. The coffee flavour changes depending on many different factors. There are four points in a coffee´s lifespan where its flavour can drastically be changed. The first being its genetics: altitude, micro region and varietal. The coffee cherry's quality is at its peak when harvested deep red. The second being how it is processed can showcase the inherent flavour attributes of the bean. The third being the roast level, whether light, medium or dark. And finally the fourth being how we extract the coffee, whether espresso, pour over, French press or simply cowboy style. It is because of these nuances that people developed a system to classify coffee. In recent years experts have even begun to borrow tools from the wine industry, most importantly the wine flavor wheel. The flavor wheel describes different aromas and flavors in your cup of Joe. The quality is determined by several characteristics: flavour, fragrance and aroma, residual taste, acidity, body, uniformity, and clarity. Now it's time to test your taste buds with a coffee challenge. You can identify fresh aromas ranging from ripe fruits and spices to chocolate and even a garlic/onion combination in different roasts of coffee beans before, and after grinding. Contrary to popular belief, the lighter the roast the higher the caffeine content. Also in lighter roasted coffees you can detect more unique aromas and flavors. Finally, hot water is added to the ground coffee to enable you to taste each variety. This tasting portion of the tour focuses on immersing the senses in the characteristics of the coffee. Guests learned to identify different coffees by aroma, flavor, body, and acidity. This allows them to differentiate between different types and qualities of coffee. It was an overwhelming sensory experience, though the professionals make it look easy. Ecuadorian barista 2014 & 2015 champion Diego Felipe Mejia has been invited to compete in the Third Global Barista Championship, December 2, 3 and 4, in Harbin, China. He will use San Lorenzo brand coffee grown at Hacienda La Papaya in Loja Province. There is still some controversy about health benefits or side effects from caffeine. It is mood enhancing, increases alertness and performance, and has antibacterial properties for prevention of dental cavities. The negative side effects include insomnia, and diuretic effects - in excess nervousness, and accelerating heartbeat. The Consejo Cafetalero Nacional is one of the institutions in Ecuador which promote the development of the industry. However, government COFENAC, CORPEI, are primarily interested in high-yield production and sales, not quality. Most government funds are going into Robusta plantations and low quality Arabica plantations and very few make it to high quality regions. In 2014, 86% of their coffee exports were instant coffee and only 14% green coffee. and ANCAFE (Asociación Nacional de Exportadores de Café) are amongst Ecuador's leading coffee companies. The country lacks a solid coffee agency to promote good practices and give technical assistance to farmers, such as the Federation of Coffee Growers (FNC) in Colombia. This is due to lack of funding, and the fact that coffee is not considered a primary agricultural activity in Ecuador like it is in Colombia. Focus has been on production volumes and lower quality coffees.